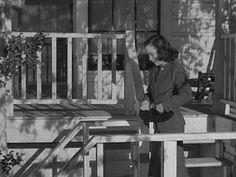 Hitchock uses shadows to give hidden messages within the film. 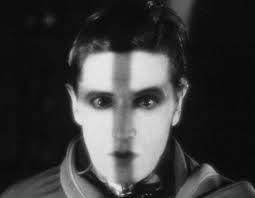 In The Lodger when Hitchcock portrays the cross on the Lodgers face it does not symbolize Christianity but symbolizes that he is two faced. 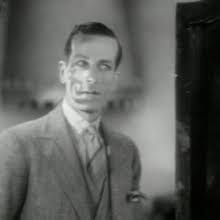 In the film Blackmail Crewe was portrayed as having an evil mustache appear across his face. The mustache symbolizes Crewe as being an ominous character. This entry was posted in Hitchcock Motifs on September 21, 2014 by sunnyd. 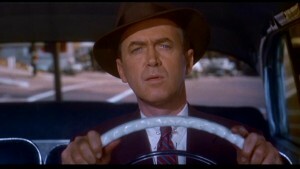 One of the reoccurring Hitchcock motifs is the use of the Triangle. Not only as a plot point, but as a visual as well. 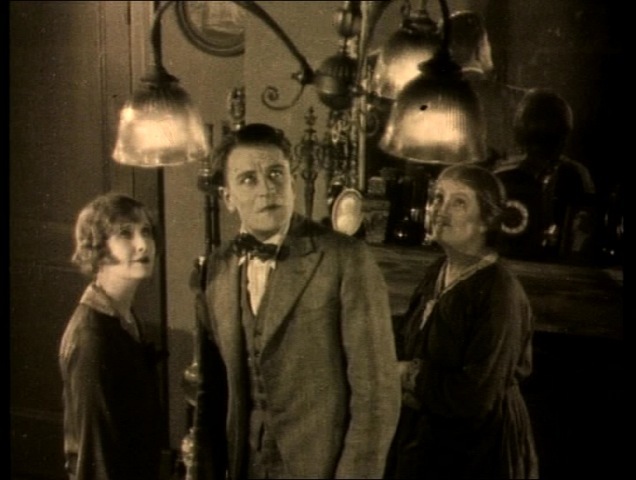 For example, in both The Lodger and Blackmail, there seems to be one central female character and two potential male love interests creating a love triangle. This is a very common theme told through several of Hitchcock’s films including Mr. and Mrs. Smith, Notorious, Rope, Dial M for Murder, Strangers on a Train, and several other works. Daisy is involved in a love triangle with Joe and the Lodger. Alice is involved in a love triangle with Frank and the artist, Mr. Crewe. 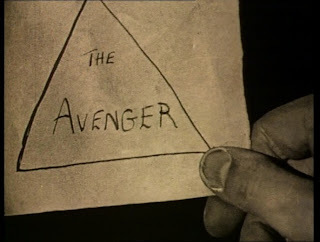 Hitchcock used quite a bit of imagery involving triangles between the two films as well. This entry was posted in Hitchcock Motifs, Silent to Sound on September 16, 2014 by ednamode. The idea of observation as opposed to really living these is a truly remarkable movie motif. Hitchcock allows the audience to feel as though they know the neighbors whom Jefferies is observing. I found it curious the way Stewart’s character reacted to entrance of Grace Kelly into his life. He was unconcerned frankly wanted her to leave. Stewart’s character was more involved with the outside world in which he was observing than making real and present relationships. I thought the suspense of watching Kelly’s character move about the room was truly ingenious. The moments in which the audience does not know where she is, or where the killer is left me on the edge of my seat. Hitch did a great job with the film. This entry was posted in Hitchcock Motifs on April 28, 2014 by Emily White. I was very surprised to see this camera angle in Spellbound. Even in modern movies, where seeing scenes through 1st person perspectives of characters is more common, the visual of the gun being wielded by the person we see through is a bit shocking. The idea of voyeurism plays a big part here, as the audience now becomes the threat and the gun wielder. Horror movies occasionally play out this idea of showing the world through the killer’s eyes. This entry was posted in Hitchcock Motifs on April 15, 2014 by cmeadows. Throughout Hitchcock’s films, a frequently recurring motif is staircases. 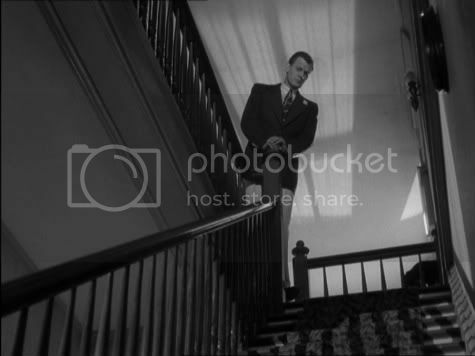 In the movie Shadow of a Doubt, stairs are used for many reasons, including to symbolize escape. In the image below, Charlie is using the back staircase of her house as an alternate way to leave. She does this frequently, mainly in an effort to avoid her Uncle Charlie, when she begins to suspect him of being a murderer. This staircase image is iconic as well. It has a very ominous cast; Uncle Charlie is looking down the staircase at young Charlie, and she already strongly suspects him of murder. The stairs represent danger; Charlie inevitably has to climb the stairs, even though her uncle is at the top. 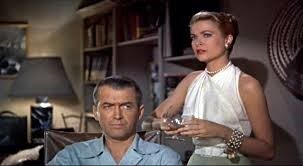 Another movie in which stairs play an important role is Vertigo. The main character suffers from fear of heights, so staircases are an excellent way to dramatize this. In both scenes, the first when Scottie is unable to make it up the stairs to ‘save’ Madeleine, and again when roles are reversed and he drags her up the stairs, the stairs add dramatic effect. This entry was posted in Hitchcock Motifs on March 21, 2014 by lmeyer3. Handcuffs are one of the most common motifs throughout Hitchcock’s films. Whether it’s a quick flash, or a major plot device, it goes without saying that Hitchcock loved handcuffs. And why not? Handcuffs are versatile and very open to interpretation. But what exactly is he trying to say? The sexual and authoritative overtones are obvious, but since handcuffs are something that spans several films, it’s worth delving into a little bit. In Blackmail (1929), the use of handcuffs is much more subtle and rare than his other films. Hitchcock’s near obsession with authority is written all over this work, and there is little more that sums it up better than handcuffs. Handcuffs are the ultimate symbol of police authority especially, given that only the police are allowed to make arrests. This is clearly evident in the opening scene, where Frank and his partner make their on-screen arrest. Set in an obviously working class neighborhood, the presence of the law barges in, bringing their handcuffs with them. The following shots rush through the booking process, of which the handcuffs are the centerpiece. The shot below is in reference to the scene where the Frank and his fellow officers are fraternizing after work. Here we have a pretty intimate scene between men, yet the handcuffs make a big appearance. Where the police go, they go, no matter how relaxed the setting. It’s almost a sign of insecurity. There is a decidedly brave, almost Marxist theme going on here embodied in these two scenes. Just as an officer needs his to protect himself against violent criminals, Hitchcock wants us to know that cuffs are the only things standing in between civilization and chaos (with his tongue in his cheek, of course). 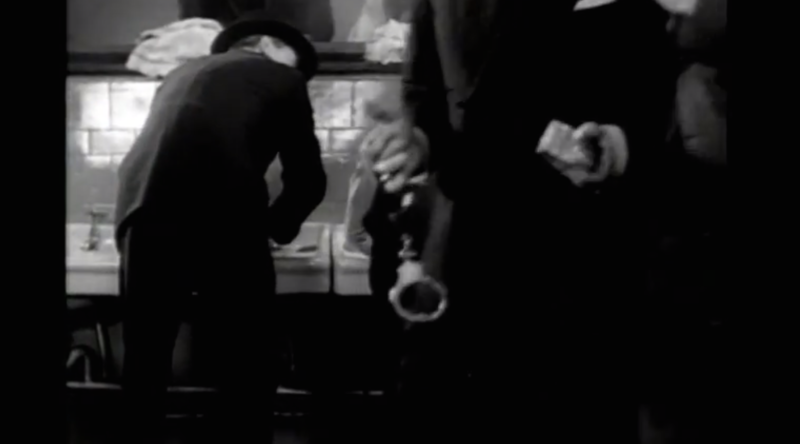 In The 39 Steps (1935), however, we see handcuffs in an entirely different light. Here Hitchcock takes an even bigger leap into social criticism. Whereas in Blackmail the cuffs are symbols of power and privilege, Hitchcock takes the image and turns it on its head. When Hannay and Pamela start as adversaries stuck together, their blossoming love nullifies the power of the cuffs. The cuffs go from tools of imprisonment to a set of wedding bands. This isn’t just Hitchcock being clever, but openly subversive. When the faceless Law tried to create a barrier between the characters, freedom and love prevails. This entry was posted in Hitchcock Motifs on March 21, 2014 by Megan. I have noticed that throughout several of Hitchcock’s films there have been falls (or near falls) from height, which have even resulted in some character deaths along the way. North by Northwest, Saboteur, Secret Agent, The Man Who Knew Too Much, To Catch a Thief, and Rear Window all have these falls from high places, however, the most notable being from the recent film we just watched Vertigo. I was able to find five instances where characters were falling from a great height, of these instances three characters ended up plummeting to their death. The first was in the opening scenes of the film; Scottie and a police officer are chasing a man on the roof of a building when he slips and starts sliding. Scottie manages to keep hold of the gutter, but as the officer reaches his hand out Scottie is paralyzed by his acrophobia and the officer falls off the roof to his death. The second instance was when Judy jumped off of the ledge into the San Francisco Bay. Here she is pretending to be Madeleine overtaken by the ghost of Carlotta when she spreads her arms and falls into the bay. The third fall comes when the real Madeleine is thrown off of the bell tower by her husband after Scottie fails to make it up the stairs to the top, paralyzed by his acrophobia once again. She falls to her death from the tower, which will evidently set the stage for the next two falls in the film. After watching who Scottie thought was the love of his life fall to her death, it takes an emotional toll on him. 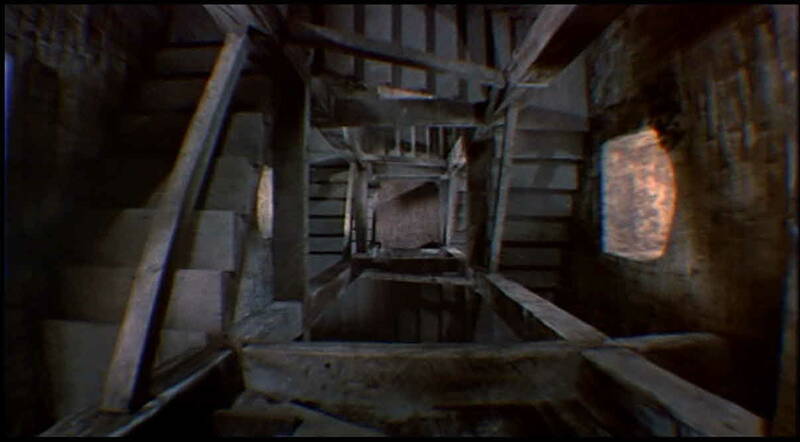 The film’s elaborate dream sequence features Scottie falling from the bell tower as well as falling into Carlotta’s hollowed out grave before he wakes up in fear from what he just dreamt. The final fall from height in the film comes when Judy falls from the same bell tower where Madeleine was thrown from. Able to conquer his acrophobia Scottie forces himself and Judy up the stairs, angry and upset after learning the truth about Madeleine’s death. While he is grabbing Judy a nun walks up the stairs obscured by the shadows and startles the both of them. It is highly debated, however, if Judy’s fall was a suicide or an accident. Regardless she falls from the tower and is killed on impact as Scottie watches from the ledge. This entry was posted in Hitchcock Motifs on March 20, 2014 by meghanking. “Strangers on a Train” is a film centered around the motif of criss-crossing. The main plot of the film is about exchanging murders with a total stranger, Bruno kills Guy’s ex- wife in exchange for Guy killing Bruno’s father. Since both men are total strangers there is no way that either could be seen as culpable. 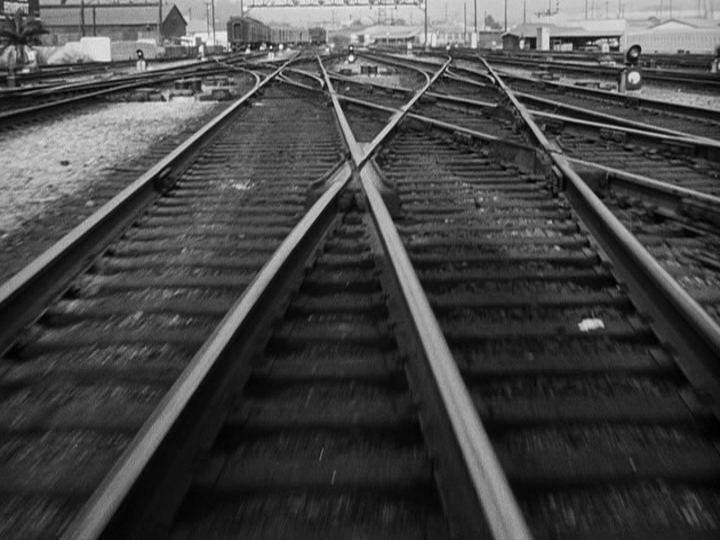 The plot causes two strangers path’s to be criss-crossed with each other, which is why Hitchcock emphasizes this motif by repeatedly putting criss-crossing images into his film. 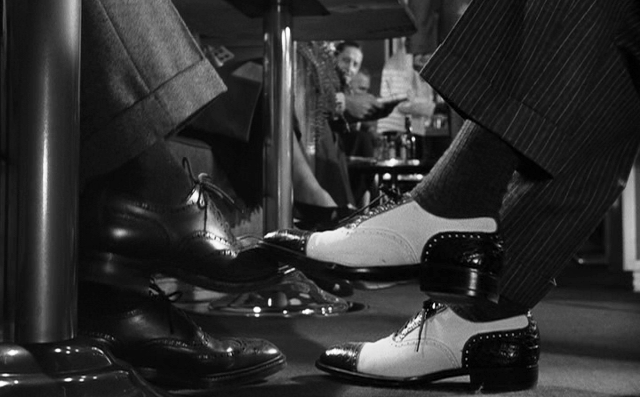 Two image is in the opening scenes of the film demonstrate this motif, the train tracks, and Guy’s and Bruno’s shoes. Another example of the criss-crossing in the film is when Bruno is staring straight ahead during the tennis match and everyone else around him is following the match. This entry was posted in Hitchcock Motifs on March 20, 2014 by akumor.